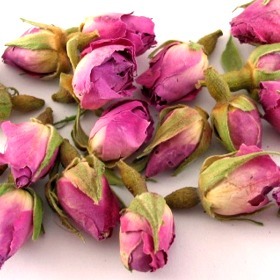 Pink Rose Bud Tea is made from real rose buds, plucked when they are young and then dried. Lovely and highly enjoyable beverage. Pink Rose Bud Tea adds spark to women beauty, relieve menstrual pain (add a bit of red wine and brown sugar), ease stomach bloatedness. Good for woman. The flowers, gathered in the bud and dried, are said to be more astringent than the Red Roses. Suitable to be blended with Black Tea to make a cup of Rose Black Tea sold commonly in tea house! Smells and tastes like the lovely rose. Beautiful, small, dried pinkish rose. An excellent complement for my tea. The smell is incredible. If you love the smell of roses this is the tea for you!! Stronger scent than the red but not a stronger taste. These pink rosebuds have a very mild flavor and are good, but I prefer the red buds better as the flavor is more intense. If you like a milder rose flower taste choose these. This tea is aesthetically pleasing as well as pleasing to the palate. Its not too strong and not bitter at all, the aroma filled my teapot even before pouring the hot water, of course the health benefits are an added plus!!! I have bought rose tea online before many times, this is so far the best. These pink roses are big, strong in aroma and beautiful. Love them, and I have recommended it already to my friends! I ORDERED 4 ITEMS AND RECIEVED 1 OF THE 4 AND ITS SAYS MY TRACKING ITEM WAS DELIVERED ? SURE WOULD LIKE TO KNOW WHERE THE TRACKING NUMBER WAS FOR THE OTHER 3 ITEMS ORDERED AND PAID FOR?